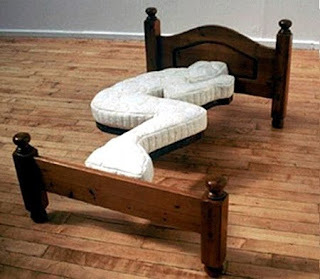 Human shaped bed – ¿¡ tjongolongo ?! And when I say human shaped bed, I actually mean a bed shaped as a human! I came across this picture of a human shaped bed last month and it immediately made me go Tjongolongo and got me intrigued, why on earth somebody would make something like this! It turns out the bed was made by British artist Dominic Wilcox. According to his website he works within the territory of ‘everyday’. He takes everyday objects and creates something with a little bit of dry humor and adds a new perspective to those everyday objects. The human shaped bed was one of his first objects which he made in 1999 while at college. He used his own body as a template for the mattress. I think this bed is really funny and I would like to see it for real once, it already looks weird in the picture, let alone how it would feel if you would lie on it! It would be fun for a company that sells beds to have one in the store, I’m sure people would actually come to the store just to see this bed and lie in it for a sec, just to see how it feels. Would be another interesting marketing idea, but probably quite hard to achiev, you don’t just make beds like this. You also might lose some clients though, seeing as this bed is for single people only! All in all I think this bed is a creative piece of art and should inspire any marketer in the business of selling beds! I think this bed is funny, what do you think? A garbage can as a toilet?